Did you know 100% of your employees have chronic disease? Wellsource says so! « They Said What? Home » Uncategorized » Did you know 100% of your employees have chronic disease? Wellsource says so! 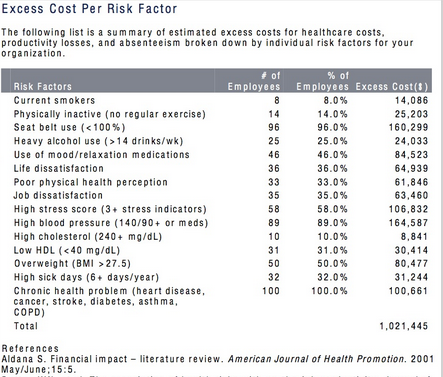 Did you know 100% of your employees have chronic disease? Wellsource says so! How is it that 100% of the employees at this company have a chronic disease? If “cancer” were a chronic disease as you claim it is, like diabetes or heart disease or asthma, how come no one ever says: “I have lung cancer, but my doctor says we’re staying on top of it”? If “stroke” were a chronic disease as you claim it is, how come every minute you don’t get to the ER following a stroke increases the odds you’ll end up like the Kardashians? Wouldn’t “stroke” be the epitome of an acute event rather than a chronic disease? If all these people are so sick, how come the largest opportunity per employee to save money ($40,000/employee!) is to get a few more people to buckle their seatbelts 100% of the time instead of 95% of the time? Speaking of seat belts, does it increase your credibility with potential purchasers that seat belt use is expressed the wrong way (96% buckle, meaning the correct figure to enter here would be “4%,” the ones who don’t always buckle)? If a whopping 89% of your employees have high blood pressure as defined by 140/90, do you think there is a chance you made a mistake in measuring this variable? How can you save $6154.28 per employee in health spending just on these items when the average employee doesn’t spend $6154.28 in healthcare costs altogether? How is this $6154.28 savings/employee figure (expressed in your materials as $615,428 for the 100 employees in this company) consistent with sourcing Steve Aldana, who claims that you always save $1358.85 per employee, whether you get a 0% improvement or a 100% improvement in risk factors? By Al Lewis in Uncategorized, Wellness on August 19, 2014 .